HotT 48 AP battle with 28 mm. minis. As we did not fancy anything very complex to play (we're getting old) we decided for a game ofHordes of the Things. So my buddy dusted off his two 48 AP armies and we quickly readiedthem for a battle. 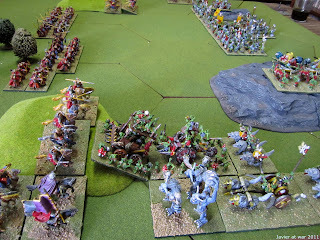 I took an army of Rohan from LOTR and my buddy a Goblin army from GW. My army consisted of 1 Kn (Gn), 1 Kn, 6 Riders, 4 Wb, 4 Shooters, 4 Sp with a Sub general in it, 1 Hero and 1 Magician. 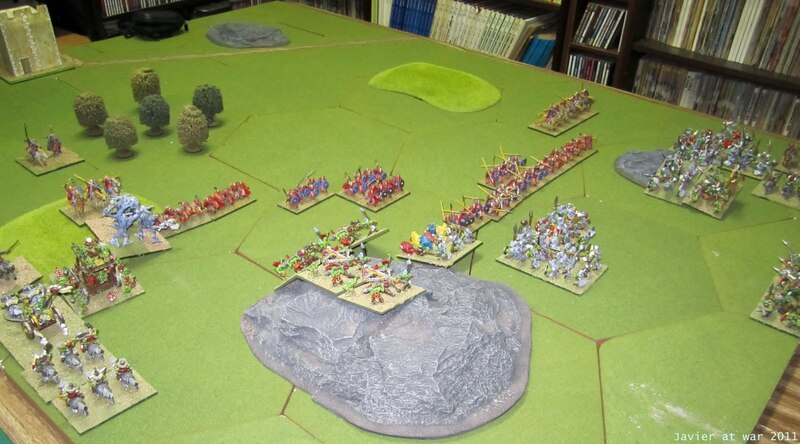 The Goblin army contained 3 Behemoths, 1 Kn (Gn), 2 Beasts, 4 Shooters, 3 Riders (one of them sub general), 4 lurkers and 12 Hordes. 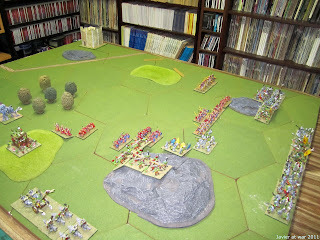 Below you can see the armies arrayed and already moving towards each other. I got a lot of PIPs at the beginning and could go through the forest in no time, as my opponent unwisely chose not to use his Lurkers to stop me there. 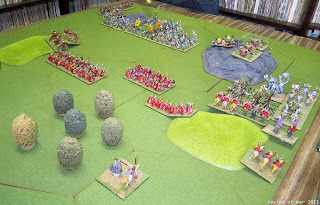 On the left flank I run with five Riders whereas on the left flank there were the Knights with the general, one Rider, the Hero and the Magician; on the center all the infantry with two shooters on each flank. My opponent moved all his hordes between the two rough hills to protect both flanks, tried unsuccesfully to deploy his shooters on the bigger hill, and advanced with his general and the three Behemoths on my right flank. The first melee in the battle was with my Hero against a Behemoth who retreated and stomped his general! (the one in chariot with wolves). 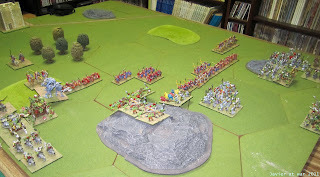 As this was the first contact and we did not like to start a game again, we simply swapped places with the general and other unit and kept with the battle. After that, a fierce fight for the hill ensued between the two generals, mine with knights and Hero and his with Behemoths. I had a slight advantage for being on higher terrain but my knights followed and lose such benefit, being subsequently crushed, and then the Hero and the Rider forced to retreat. On the left flank I squeezed three units of Riders to disorganize the solid block of Hordes, while the center kept slowly advancing forward. My three Riders on the left were surrounded and effortlessly eliminated, and my Hero barely held against the Behemoths while the Magician did nothing (actually he did nothing during all thegame due to the lack of PIPs). 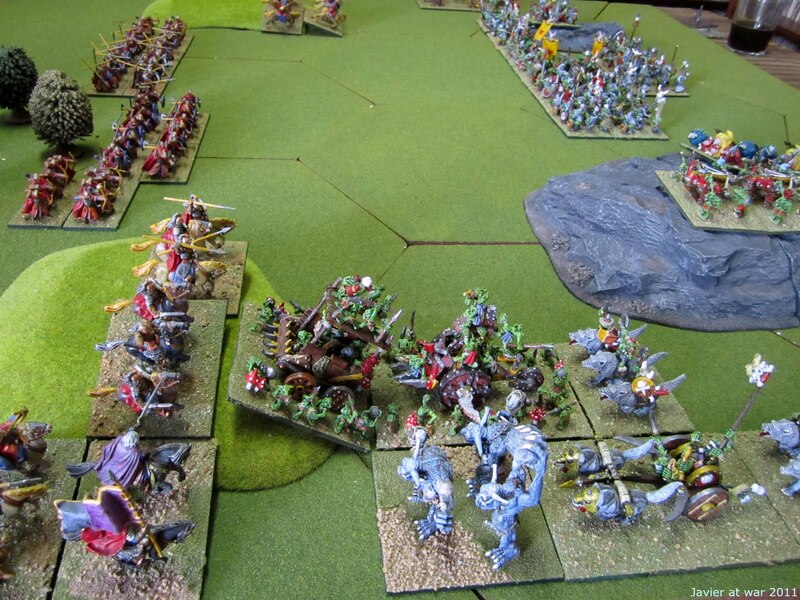 My infantry on the center finally clashed and started to massacre Hordes of Goblins. The Goblin general and his Behemoths kept pressing and killed my Hero and then my Magician. All the Hordes killed were quickly redeployed again into the battlefield. 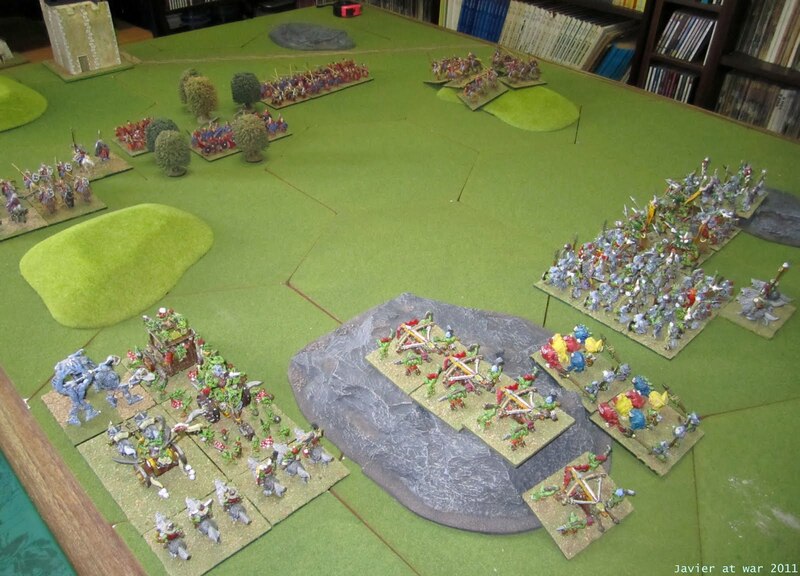 I had already lost my general and now my main army, and the infantry was unable to do something effective, so we decided to finish the game in that moment with a major victory for the Goblins. 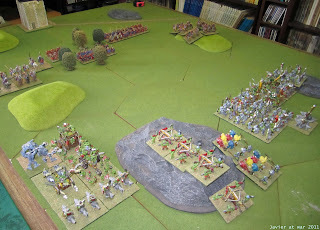 48 APs armies with 25/28 mm. figures look really impressive on the table, especially for me, used to 10 mm. Right after New Year we gathered to play Wings of War, a game easy, fast and fun to play to start off with this 2011; but I could not post it until now as my PC melted down after nine years of loyal service. 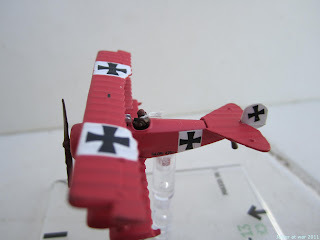 The Richthofen's red Fokker I own belongs to the first serie of the game wich came without pilot, so I decided to put one and took one old GW's Epic Imperial Guard trooper and painted it like a WWI pilot; the scarf was done with a tiny piece of paper. One moment during a game. 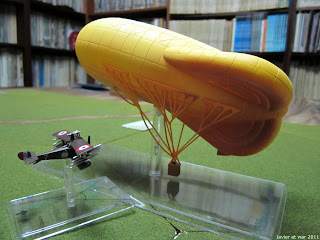 Richthofen in peril! 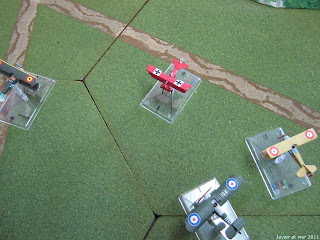 We managed to play three games during the evening in which I was quickly shoot down in all of them, and then I played a solo game trying to destroy a balloon, but my Nieuport 16 missed all its rockets and then was shot down again by the AA. 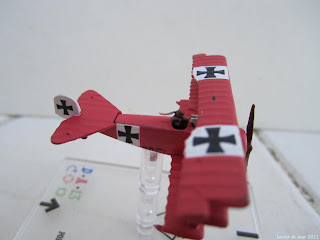 Next day I encouraged my six years old son to play a simple game, and he enjoyed it a lot and was willing to play again another day, even though I shot down his plane! Wings of War is an excellent game as it is very easy to learn, fast to play, miniatures are already painted and there is no need of terrain as you can play on any flat surface.